Mauna Kea is the second highest volcano in the Pacific. It is a dormant volcano with a small possibility of eruptions in the future. 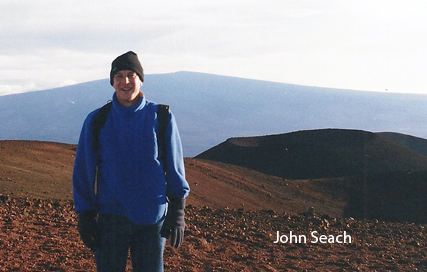 Eighty percent of people who summit Mauna Kea suffer from altitude illness, due to rapid ascent from sea level. The irregular topography of the upper slopes of Mauna Kea contrasts with the smoother profile of Mauna Loa volcano. Mauna Kea volcano is in a post shield stage of evolution. It is only 35 m higher than nearby, Mauna Loa volcano. Mauna Kea does not have a summit caldera, but there are numerous cinder cones. There have been no historical eruptions at Mauna Kea volcano. At least seven separate vents erupted between about 6,000 and 4,000 years ago on the mountain. The volcano in not yet extinct, and future eruptions will occur. The volcano is about one million years old. Radiocarbon dates obtained from algal sediments at the bottom of Lake Waiau, indicate the summit ice cap disappeared by about 10,000 years ago. 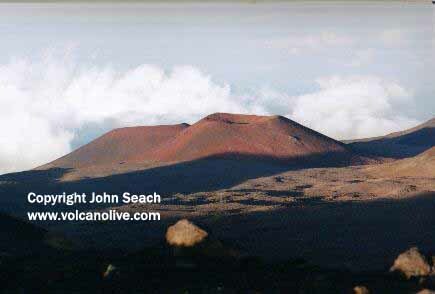 More than 300 cinder cones are located on the upper slopes of Mauna Kea volcano reach concentrations of 8 per sq km. Height-width ratios and crater dimensions reflect the equilibrium angle of repose of constituent tephra. Most cones have westerly asymmetries which reflect trade wind direction. Cones at the summit define an ellipse approximately 2.1 X 2.8 km. These cones may lie along the margin of a buried caldera. 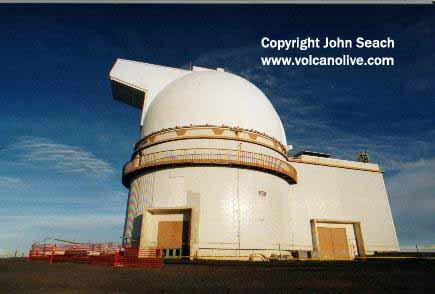 Most cones at Mauna Kea are 200 to 600 m wide and 30 to 100 m high. A series of earthquakes occurred under Mauna Kea volcano in Hawaii on 19th October 2011. The largest earthquake was magnitude 4.5 and had a focus at a depth of 18 km at a location 9 km NE of the summit. 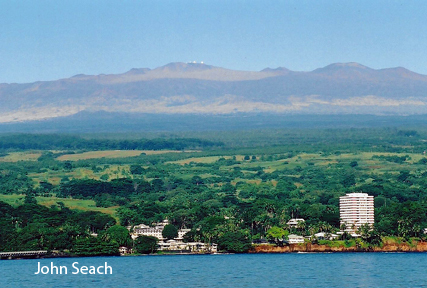 On 26th April 1973 a magnitude 6.2 earthquake occurred 15km north of Hilo, Hawaii, at a focal depth of 48km The location was beneath the east flank of Mauna Kea, a volcano dormant historically, but active within the last 4000 yr. Aftershocks were restricted to a depth of 55-35km. The earthquakes were not related to volcanic activity at Mauna Loa and Kilauea volcanoes, and may indicate a deep seated prelude to a resumption of activity at Mauna Kea. There are seasonal snow falls on Mauna Kea volcano, with depths up to a few metres. 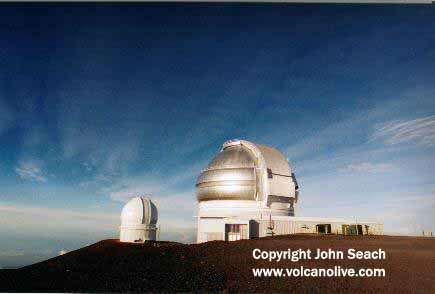 Mauna Kea Observatory houses the world's largest observatory for optical, infrared, and submillimeter astronomy. Telescopes are operated by astronomers from eleven countries. Major instruments on the mountain include, Keck Observatory, Subaru Telescope, Gemini Northern Telescope, United Kingdom Infrared Telescope, Canada-France-Hawaii Telescope, NASA Infrared Telescope Facility, UH 2.2-m telescope, Caltech Submillimeter Observatory, James Clerk Maxwell Telescope, Submillimeter Array, and Very Long Baseline Array.